American Association of Orthopedic Medicine www.aaomed.org offers training by major body section and several different venues, some of which offer treatment of patients by the participant for direct learning, in the presence of an experienced instructor. 1. Continous use of ultrasound to access areas otherwise not completely treatable. 2. Combining prolotherapy and PIT optimally using most current approaches. 3. Managing treatment with maximum comfort using oral agents while preventing complications from those agents. This is particularly important as 50% of patients with chronic pain have dysautonomia will will tend to have nausea or lightheadedness with pain medication. 4. Combining use of dextrose and PRP with an emphasis on using PRP in areas it is most effective. 5. Research evidence and optimal options/methods for research. Although training physicians in large groups is not his primary objective, he does occassionally do so. For example he had the privilege to serve as primary lecturer for a three training in combining prolotherapy and perineural injection from September 28-30, 2018. On September 30, 2018, he spoke at En Myong Hall at Severence Medical Center, Yonsei University, Seoul, South Korea, as primary lecturer for a one day seminar. 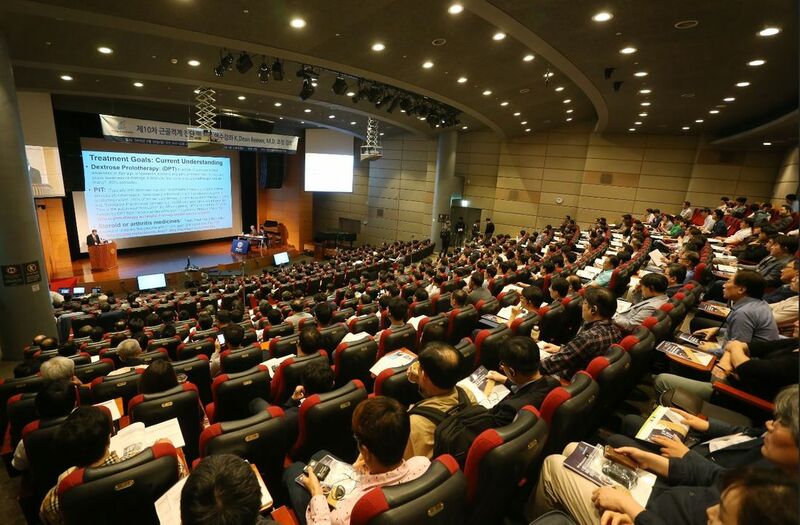 420 were in attendance, nearly all physicians, and nearly all Korean. 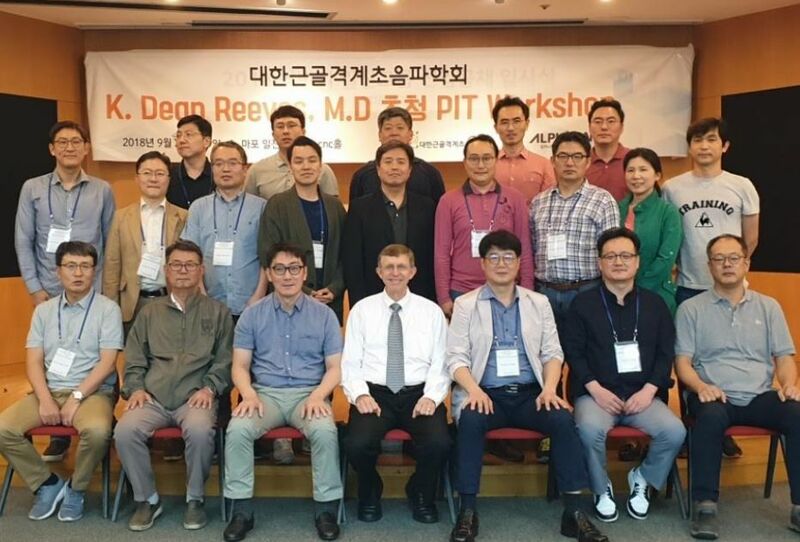 South Korea has fine instructors in prolotherapy and the use of ultrasound, many of which are pictured below; several of which presented during the seminar periods. Dr. Baek, the current president of the Korean Association of Orthopedic Medicine is seated to the right of Dr. Reeves in the picture below. For physicians interested in combining prolotherapy and PIT, a recent powerpoint presentation from Dr. Reeves given at the American Association of Orthopaedic Medicine in 2018 is available as an introduction.